This is a great quick breakfast that I like to make when I'm out of bacon and sausage or any of the other boyfriend breakfast staples. This seems to keep him happy in the absence of cured meat. Whisk milk and egg together and mix with flour, sugar and salt (do not over mix). Melt butter in a large (10 - 12") cast iron pan over medium heat. Add batter to pan and let cook one minute on the stove top before placing in the oven. Cook in the oven 15 - 20 minutes. 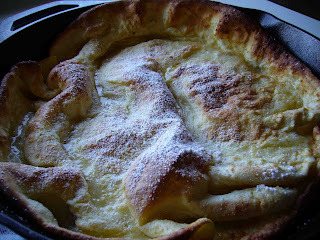 When finished cooking, dust with powdered sugar and serve immediately in the pan as the pancake will deflate very quickly. Enjoy! I haven't had one of these in so long andit looks so good. I may have to make it for breakfast tomorrow! Hi Michele - sounds like our boyfriends have a lot in common. Let me emphasize that this is only acceptable if there are absolutely no meat options in the house!